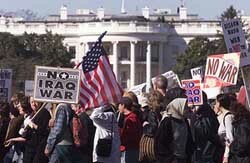 Thousands of Americans from more than 100 cities surrounded White House in a peaceful anti-war protest in perhaps their last chance to dissuade the Bush Administration from invading Iraq. President Saddam Hussein placed Iraq on a war footing on Saturday night, issuing a decree that divided the country into four military districts under his command and ordered them to "destroy" any US-led invasion. With a diplomatic consensus in the UN Security Council to resolve the Iraq standoff eluding, British Prime Minister Tony Blair has held an emergency ‘war Cabinet’ meeting to review the military’s readiness, which also gave the UN time till tomorrow to choose between war and peace. Pope John Paul today made one of his strongest appeals for a peaceful resolution to the Iraq crisis, warning of ‘’tremendous consequences’’ if war broke out in Iraq. “The political leaders in Baghdad have the urgent duty to collaborate fully with the international community, to eliminate any motive for an armed attack,’’ the Pope said at his weekly Angelus address in St Peter’s Square. The USA will not punish key ally Pakistan for refusing to back a planned war against Iraq because Washington knows that supporting the war could undermine President Pervez Musharraf and endanger the war on terrorism, Pakistani analysts say. In an attempt to breathe life into the dying diplomatic process, France, Russia and Germany called for a meeting of the United Nations Security Council at Foreign Ministers’ level on Iraqi crisis on Tuesday, but diplomats say it is futile unless there is real change of heart by major powers, which is highly unlikely. China today completed a smooth transition of political and military powers by installing an energetic and younger generation of technocrats led by President Hu Jintao and Premier Wen Jiabao as leaders to steer the communist nation’s destiny for the next five years. In a major catch after top Al-Qaida leader Khalid Sheikh Mohammed, the Pakistan authorities have arrested another key operative of the terror network Yasser Al-Jazeeri along with five accomplices in Lahore, official sources said. Carrying signs with such messages as “Stop mad cowboy disease’’ above a picture of President George W. Bush, the demonstrators yesterday beat drums, sang songs and chanted as they marched from the Washington Monument to White House and finally to the Justice Department. “President Bush, listen to your people — the American people before you today, who say, no war in Iraq,’’ Howard University student Peta Lindsay told a cheering crowd at a mid-day rally. The demonstrators, from throughout the country and across the ideological spectrum, waved flags and placards and chanted slogans like “Send our troops home’’ and “No blood for oil.’’ Some flew rainbow kites with “peace’’ written on them. “The Iraqi people are not our enemies — they are our sisters and brothers,’’ another Howard University student Caneisha Mills told the rally. Bush spent yesterday away from Washington at the Camp David presidential retreat in Maryland. But he used his weekly radio address to brace the public for war, saying he saw little hope that Iraq would disarm peacefully. Despite his absence, police cars kept the demonstrators to a route about a block’s width away from White House. The Washington police said the event was largely peaceful but that five people were arrested for “unlawful entry’’ to World Bank headquarters, several blocks from White House and the demonstration route. This morning, Bush heads to Portugal’s Azores islands for an emergency summit with leaders of Britain and Spain in a final pursuit of a UN resolution that would set the stage for war against Iraq over its alleged weapons of mass destruction programmes. The resolution sponsored by the three countries is the subject of a bitter fight among UN Security Council members. First-time demonstrator Patty Crotau (28), left her home in upstate New York on Friday afternoon and came to Washington by bus. The mother of two said she came because she believed the Bush administration’s current stance was hypocritical. The Washington protest is one of the several planned yesterday in the USA, designed to coincide with similar demonstrations throughout Europe, Asia and Australia. In San Francisco, thousands of protesters chanted, played guitars, beat drums and carried signs reading “How many lives per gallon?’’ in an anti-war march that stretched for about a dozen city blocks. In Tampa, Florida, about 100 people rallied outside the gates of the MacDill Air Force Base, home of the US Central Command. Nearly 1,000 people took part in more than a dozen protests in and around Boston, organisers said. The police arrested one person for disrupting traffic on a busy bridge between Boston and Cambridge, Massachusetts, witnesses said. There were also counter-demonstrations in other cities, including Atlanta, where about 2,000 people gathered in downtown Atlanta in a “Rally for America.’’ Organisers said the event was designed to voice support for the US military and was not necessarily pro-war. Faced with prospects of war to unseat him within days, Saddam named close aides to command the districts, including his eldest son Qusay, who was charged with commanding the key areas of Baghdad and Tikrit, the government’s powerbase. "The Revolutionary Command Council (RCC) issued a decree today that forms four regional leaderships under President Saddam Hussein to take the necessary steps to repulse and destroy any foreign aggression...and securing the domestic front," the state Iraqi News Agency (INA) said late yesterday. The decree was issued on the eve of a summit between the leaders of the USA, Britain and Spain in the Azores islands after efforts to win new UN backing for war on Iraq floundered, saying there was little hope Saddam would disarm. The crisis summit is expected to set the stage for military action. The decree, numbered 61 and signed by Saddam, divides Iraq into four districts: northern Iraq, southern Iraq, central Iraq, and Baghdad and other areas to the north, including Tikrit. It appoints Qusay in charge of Baghdad and some other central areas. The Cabinet held yesterday, ahead of the crucial Azores summit to be attended by US President George W Bush, Spanish Prime Minister Jose Maria Aznar and Mr Blair, also discussed final plans for military action against Iraq. The UN was given time until tomorrow evening to come to a final choice on whether to back a second resolution or see the USA and Britain launch military action against Iraq. If Britain and the US fail to muster the required nine votes to pass the resolution in their favour in the council they are expected to dump plans to put it to vote and announce that Saddam is in “material breach” of the UN resolution 1441 passed last November and go ahead with war, sources said. It is expected that an air-bombing campaign followed by a massive ground offensive would start within a few days, they said. Mr Blair is also planning to hold an emergency meeting of the full Cabinet early this week and announce a vote in the House of Commons, probably on Tuesday, if the UN route is exhausted by tomorrow night. “But I would also like to remind the member countries of the United Nations, especially those that make up the Security Council, that the use of force represents a last resort,’’ the 82-year-old Pope said. Pakistan, with a 95 per cent Muslim population, has said it would not support military action on Iraq. The Cabinet decided last Monday, according to ruling party officials, to abstain when it looked like a vote on war was imminent in the United Nations Security Council where Pakistan has a non-permanent seat. Pakistan is a pivotal player in the US-led campaign to wipe out the al-Qaida terror network and hunt down its supremo Osama bin Laden. Islamabad’s cooperation has kept it winning a host of rewards right until Friday when Washington announced the lifting of the last remaining military sanctions imposed after Gen Musharraf’s coup in October, 1999. After the September 11, 2001, terror attacks, Washington lifted nuclear-related sanctions on military sales and training, pumped more than $ 1 billion in aid, paid $ 600 million dollars for using Pakistani air bases and corridors, rescheduled $ 3 billion debt and promised to write off $ 1 billion dollars. Now Pakistani officials fear they will have to pay a price for saying no to US requests to support their push for war. “There could be negative repercussions from outside,” a senior foreign affairs adviser to the government told AFP, on condition of anonymity. But analysts were confident Pakistan’s importance to the USA, bolstered by the capture on March 1 of al-Qaida kingpin Khalid Sheikh Mohammed, the network’s alleged operational chief, would give it immunity from penalties. Yesterday Pakistan announced the capture of another senior al-Qaida operative, Moroccan national Yassir al-Jazeeri, bringing the number of foreign al-Qaida operatives caught here close to 450. Prime Minister Zafarullah Jamali, after appealing for more time for Iraq to disarm, on Thursday drew a line between the war on terrorism and the planned invasion of Iraq. “The war on terrorism and the war against Iraq are two different things,” he said. Pakistan can now say: “This is what we have done on one front, therefore we must have the facility to take a different position on Iraq,” Mahmud said. 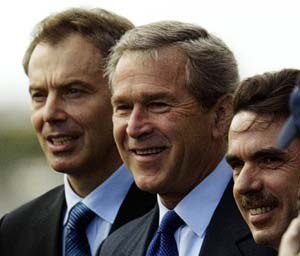 The proposal came as US President George W Bush, British Prime Minister Tony Blair and his Spanish counterpart Jose Maria Aznar were meeting in Pacific island of Azores today as a last ditch effort to win support in the council for their resolution to authorise military strike to disarm Iraq and chart their course of action if they fail to get the requisite backing. Among their options is the withdrawal of a second resolution and taking action under the authority of the previous 1441 resolution. The Foreign Ministers meeting has been proposed to coincide with Chief Weapons Inspector Hans Blix identifying in the council the key disarmament tasks for Iraq on Tuesday. As expected, the National People’s Congress (NPC), the largely rubber-stamp Chinese Parliament today formally approved the candidature of Wen Jiabao, 60, as Premier to succeed Zhu Rongji in a well-orchestrated session. Wen, as Vice Premier under Zhu, has experience in handling financial, agriculture reforms and disaster relief matters. Wen received 2,906 votes in his favour, while three votes went against him and 16 abstained, entitling him to take the reins of the world’s sixth-biggest economy. Confirming his arrest, Pakistan Information Minister Sheikh Rashid said a Moroccan national and a Pakistani had been arrested from the Gulberg area yesterday. The officials here said a team of intelligence officials raided a rented house at Bhagatpura in Lahore and arrested Jazeeri, a Moroccan national. “Yasir Al-Jazeeri is seventh in the top Al-Qaida leadership”, Rashid said, adding that a Pakistani was also arrested and the raid was conducted only by local agencies. “It is another big catch, but not as big as Khalid Sheikh Mohammed,” Rashid told a local television channel. He further said no FBI personnel was involved in the raid, as was reported earlier. Al-Jazeeri was shifted to an unknown place for interrogation and was expected to be handed over to the USA shortly. 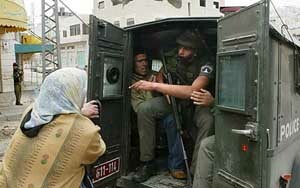 The sources said the name of the Pakistani arrested along with Al-Jazeeri was Gulzeb alias Jaffar. Al-Jazeeri might have been arrested on a tip-off given by Khalid, the alleged mastermind of the September 11, 2001, terror attacks on the USA, who was arrested some weeks ago from Rawalpindi, reports here said.